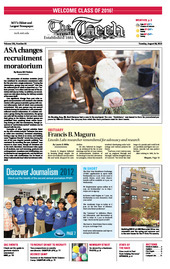 On Sunday, Aug. 26, East Campus had a cow in its courtyard. The cow, “Buckcherry,” was loaned to them for promotional purposes by Hilltown Grazers, the company from which the dorm purchases meat for dorm events. The Association of Student Activities (ASA) has redefined its recruitment moratorium rules for this year into a single statement: “During the Moratorium, groups may not recruit.” This rule, the enforcement of which is described as a “holistic process,” is in effect until the end of the Activities Midway on Friday. In addition, no recruitment can take place during the Midway outside of the event itself. Francis B. Magurn believed in keeping things simple. He drove secondhand cars his entire life and rarely shopped for new clothes. In coming back to school, you might have noticed the new bright green and black bikes zipping around Cambridge, or the similarly-colored station near Bexley at the corner of Amherst Alley and Mass. Ave. Hubway, whose logo is proudly emblazoned in green on the bikes and stations, is a bike share system that started in Boston and now, a little over a year later, has expanded to Cambridge. Hubway is managed by Alta BicycleShare, which operates bicycle sharing systems in Washington, D.C., Arlington, and Australia. Attending MIT has more perks than just getting a world-class education. Each year, through the Student Loan Art Program, MIT’s List Visual Arts Center allows students to borrow artwork for an academic year at no cost. The collection includes photography and paintings, reprints and originals, contemporary and modern works. However, students must go through a lottery first.